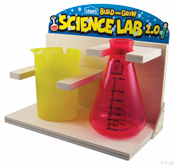 Each science kit comes with experiment cards so they can continue the fun at home! Super cute! Registration opens October 27th. Register HERE for free. This entry was posted in Capital Region Deals, Freebies and tagged Build and Grow, Lowes. Bookmark the permalink.